ELV loves sitting on the patio of Mon Ami Gabi and watching the world go by. He likes the bread, the crunchy, little apple slaw amuse, most of the salads, the rolling wine cart, the Alsatian white wines, and the fried skate wing with a snappy lemon sauce. The service is always top notch — whether or not they recognize him — and about half the time (and after dozens of visits), no one here has a clue who he is. Probably because this place routinely knocks out over a thousand covers a day. The Food Gal®, who just happened to be picking up the tab for the above repast, loves the people watching and the fresh air as well, but thinks the oysters are better at a number of joints around town (true), and everything is overpriced for what you get. For her dinero — which came to $140, including tip — she’d rather hit Comme Ça, P. J. Clarke’s or Bouchon. On one level, ELV is forced to agree with her, but on another, there’s no beating a warm summer night, or a cool fall evening, soaking in the sights and sounds of the semi-sober strolling citizens sauntering seamlessly along our sensational street. And for a restaurant feeding over a thousand people a day, we say the grub is always succulent-ly satisfying. I’m more with the Food Gal(R) on this one. I recognize that as far as views and ambiance, Mon Ami Gabi is clearly one of the top 5 spots in town. But, if you’re just interested in the food, I just don’t see it. I mean, I expect to pay a markup on food in a casino, and I expect to pay a little extra markup for a great view, but I can’t help but view this place as out of line. Steak frites here run $23ish to $40ish. Does anyone want to try to tell me that it’s better here than the $12 special at any of the better locals casinos coffee shops? Once we subtract out the extra markup, doesn’t this place violate ELV’s $20 steak rule? 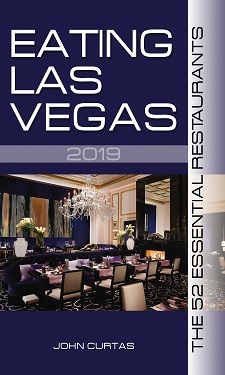 If so, can this place truly be called essential Las Vegas dining? Similarly, is the fish and chips here worth $20? Since ELV brought it up, I find Mon Ami Gabi to be the most consistently overrated restaurant in Las Vegas, and it’s one of the few entries in his eponymous guide that I found eyebrow raising. Maybe I’m the only one who feels this way. Maybe I’m missing something, and if so, I’m happy to be enlightened on the topic. What do others feel about this place?